The OceanAire 2OAC is an air-cooled portable air conditioner or ‘spot cooler’ designed for permanent or temporary cooling applications. 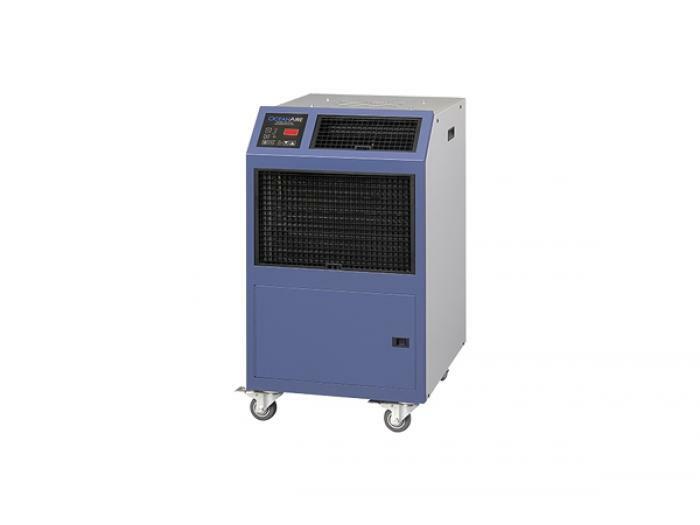 This portable air conditioner unit has been built entirely in the U.S.A. and features a premium sheet metal cabinet that is easy to roll into place and deploy for fast air conditioning. The 2OAC models are equipped with heavy duty casters for mobility and easy storage. All 2OAC models come with a 10-foot power cord for electrical connection and added mobility in service. These spot coolers are designed to direct air to specific areas or objects through a discharge grill located on the upper-front of the unit, while rejecting heat from the top of the unit. The 2OAC models provide a wide range of solutions, including commercial and industrial air conditioning applications. The remarkable cooling capacities of these models range from 12,000 BTU/HR to 60,050 BTU/HR. As described above, the 2OAC is an extremely portable unit with the entire cooling system, evaporator and condenser fan motors and electrical components encased in a powder coated metal cabinet. Selection of the proper electrical source is essential. The range of 2OAC models are controlled by solid-state electronic control panels which enables a wide range of options for temperature and airflow controls to ensure you get the right temperature quickly and easily. OceanAire offers numerous accessories and factory installed options for 2OAC models to add versatility and improve performance.